Show Dog-Universal Music trio Carter’s Chord made a recent stop in Kansas City to visit with recently elected 2011 Radio Hall of Famer, Dale Carter. (L-R) Becky, KFKF PD Dale Carter, Joanna and Emily. 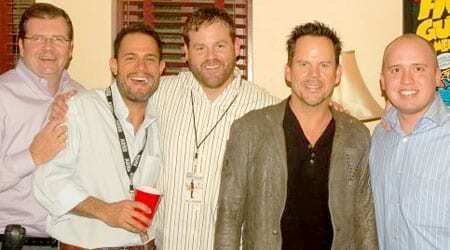 UMG Nashville artist Gary Allan played at the Fox Theatre in Atlanta last week. (L-R): WKHX’s Mark Richards and Mike Macho; UMG’s Royce Risser; Allan; and Citadel’s Jeff Davidson. The JaneDear girls spent the first day of deer season with WMIL/Greenfield, WI at their Annual Deer Hunter’s Broadcast. The girls played for fans at a local gas station with Karen, Scott, and Radar from 106.1 FM’s morning show. (L-R) front: Scott, fan, Danelle Leverette of the JaneDear girls, Karen, Susie Brown of the JaneDear girls, and Radar.